The fifth San Antonio-Class amphibious transport ship, the USS New York is notable in that part of its construction came from salvaged steel from the World Trade Center. Construction began in New Orleans in 2004, and the ship was launched in December 2007. On November 7, 2009, the USS New York was commissioned and entered active service. The USS New York can carry two LCACs or one LCU, with 14 AAVs. The aerial complement can include up to two CH-53E Super Stallions, two MV-22B Ospreys, four CH-46 Sea Knights, four AH-1 SeaCobras, or four UH-1 Iroquois helicopters. Currently the USS New York is in the eastern Mediterranean, delaying its return to Norfolk, Virginia due to the Israel-Gaza conflict. Gallery Models is a new company that exploded onto the modeling scene with their very impressive 1/350 LHD ship kits. They have now added to that fleet with this latest release, the USS New York LPD. 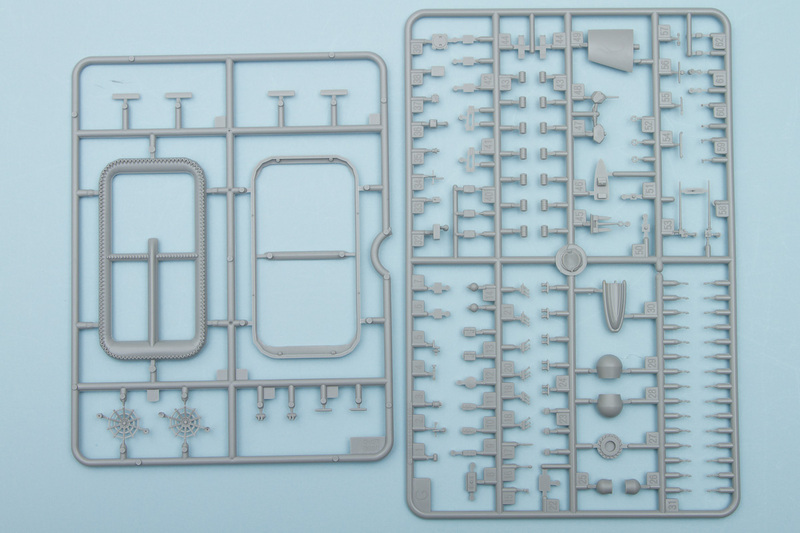 Like their earlier LHD kits, this one is packed with just about everything you could need to build a highly detailed model of the LPD-21. 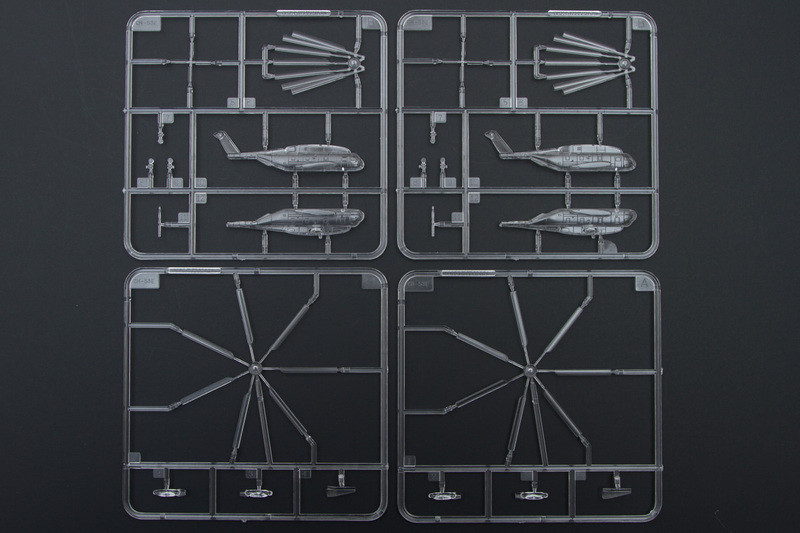 The box contains plastic, photoetch, chain, and decals, resulting in a kit that doesn't need any aftermarket sets to produce a highly detailed model. 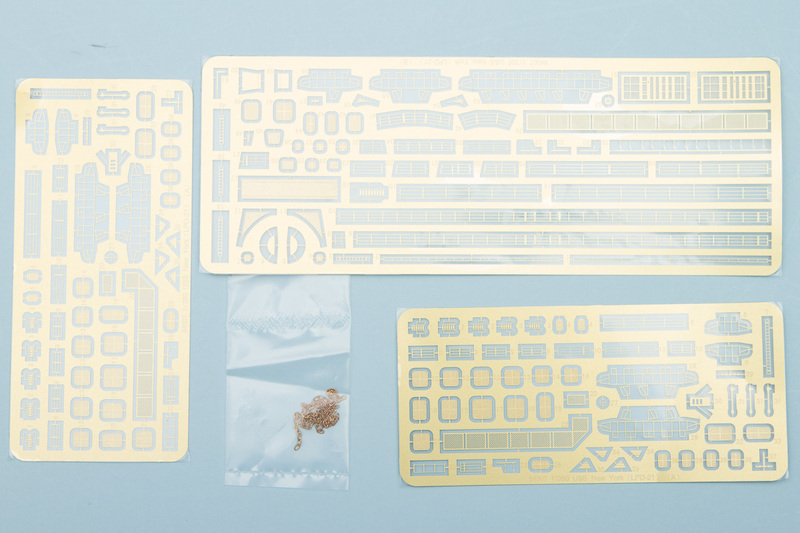 There are 406 parts for the ship itself, 108 parts for the included aircraft, 79 parts for the various landing craft, and 119 pieces of photoetch, so this kit is definitely not a weekend build. Looking at the ship first, construction begins with the assembly of the interior. Yes, this ship has a rather extensive interior, with the landing ship bay and aircraft hangar deck provided. The landing ship bay is made up from separate sides and a floor, with the ceiling formed from molded-in detail on the inside of the upper hull. 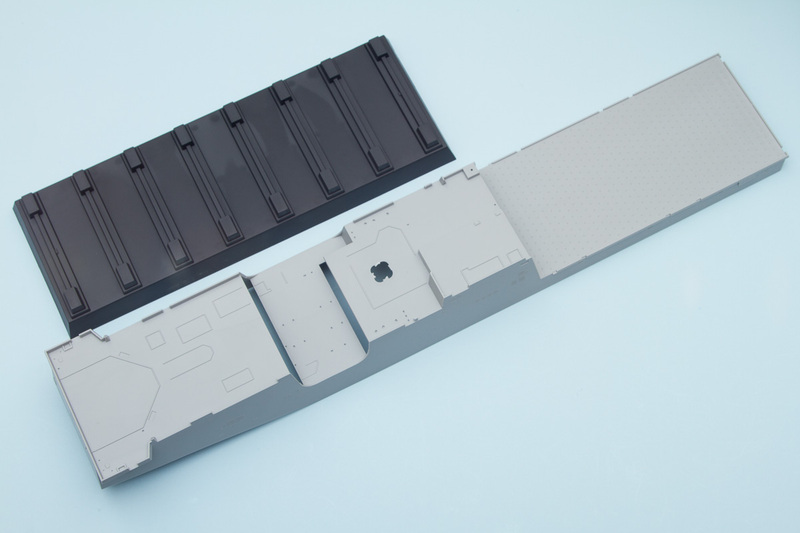 The hangar deck is built up from several pieces as well, and the completed assembly fits into the lower hull. There are additional bulkheads for the lower hull, and with all this in place, there should be no worries about the lower hull flexing during assembly. 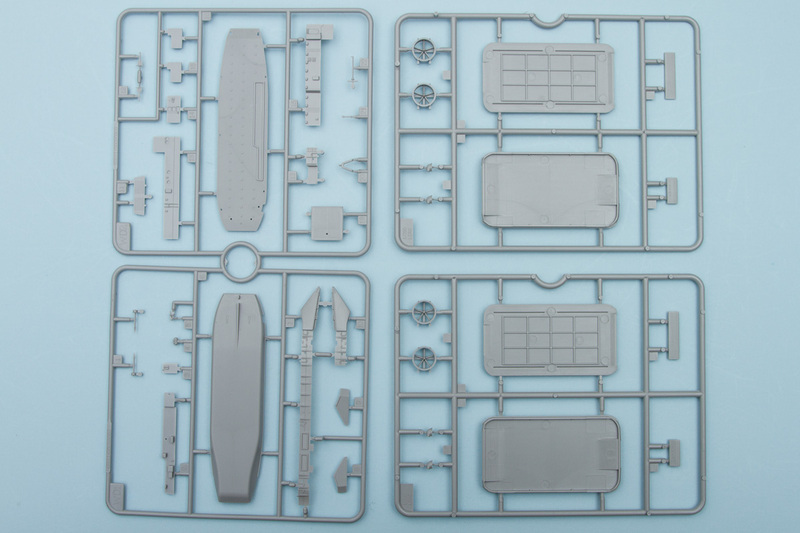 Moving on to the upper hull, there are a couple of inserts for the small watercraft, and separate faces for the aft end of the two main superstructure sections. The aft one also incorporates the aircraft hangar door, which can be displayed open or closed. The deck over the bow is also a separate piece. 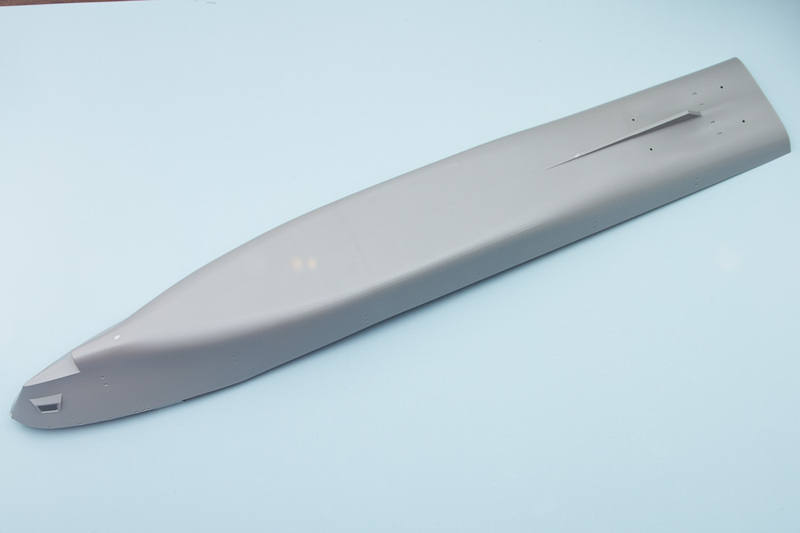 With the upper hull attached to the lower hull, the rest of the assembly turns to the smaller details, and here is where the parts count will start creeping up. For example, the railing assembly on just one side of the flight deck has over two dozen parts, and they're all tweezer-sized. Back to the main assembly, though, the superstructure is further built up with separate hexagonal stacks that fit on top of the two main superstructure sections. 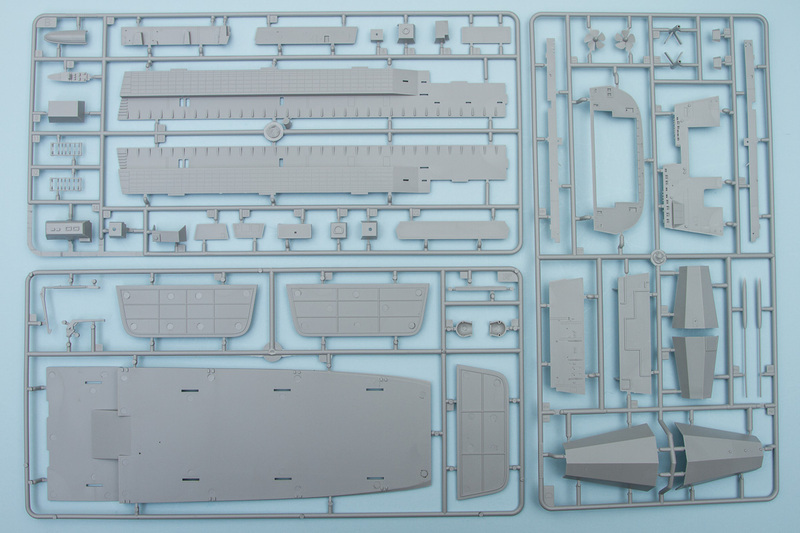 Like the flight deck, these assemblies get a fair mix of plastic and photoetch detailing, including railings and hatches. The large dome antennas that are prominent on the forward superstructure are provided, split in halves, so a bit of seam cleanup will be needed to get that smooth round shape looking right. On the underside of the hull, the strakes are provided separately, which is good as it seems kit manufacturers always have problems getting those at the right angle. Hopefully these will be correct, but if not, it should be simple enough to slightly reposition them to get the angle just right. The rudders are also separate, and the prop shafts feature separate struts and separate screws. The bulbous bow is provided as a separate piece, split in half, that mates up to the one-piece lower hull. This is a good way to make sure the shape is crisply molded, but there could be some potential for a step here. I recommend plenty of test fitting to make sure everything is clean here, as that is a very prominent piece. With the addition of some other small details, the LPD-21 is finished and attention can turn to the other watercraft included in the kit. The LCU features a separate lower hull and separate deck, with two separate prop shaft/screw assemblies completing the lower hull. The sides are separate, and build up almost the entire sides of the LCU. The superstructure is built up from four sides and a separate top, on which goes additional details, and the addition of the bow door completes the LCU assembly. The two LCAC vessels are similarly well detailed. The air cushion assembly is split into upper and lower pieces, on which fits the main LCAC deck. The two superstructure pieces are separate, and feature separate propeller housings made up from five individual pieces. Also separate are the two intakes, which can be positioned independently depending on sea state, wind, etc. The air cushion is depicted as inflated, so for those wanting to display their LCAC on the beach, shut down, be ready to do quite a bit of work recreating the deflated cushion. For use on either the LCAC or the LCU there are two AAV-7 vehicles, made up from a two-part hull, two tread assemblies, and a separate turret. 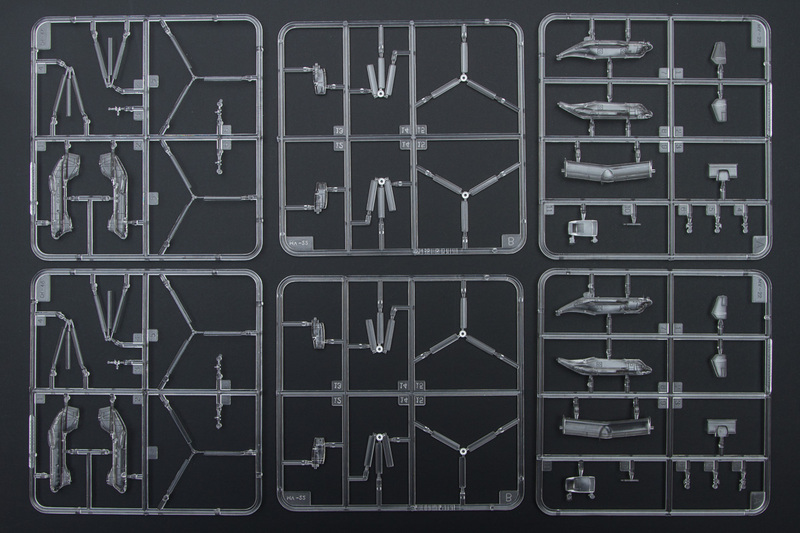 Moving on to the aircraft, all of these are molded in clear, to facilitate the representation of canopies and windows. 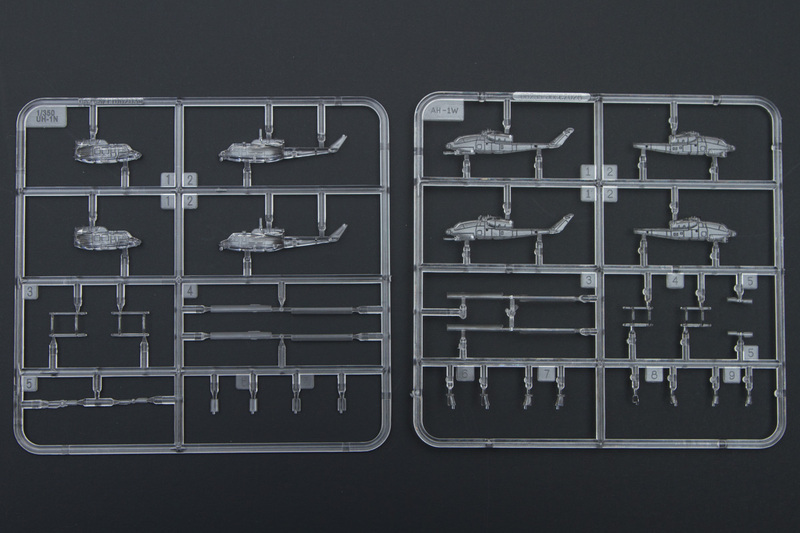 The kit comes with two AH-1W Super Cobras, two UH-1N Iroquois, two CH-46 Sea Knights, two CH-53E Super Stallions, and two MV-22 Ospreys. The AH-1W Super Cobra has a two-piece fuselage, separate rear boom fins, separate main and tail rotors, separate skids, and separate side fins. The UH-1N is similarly broken down. 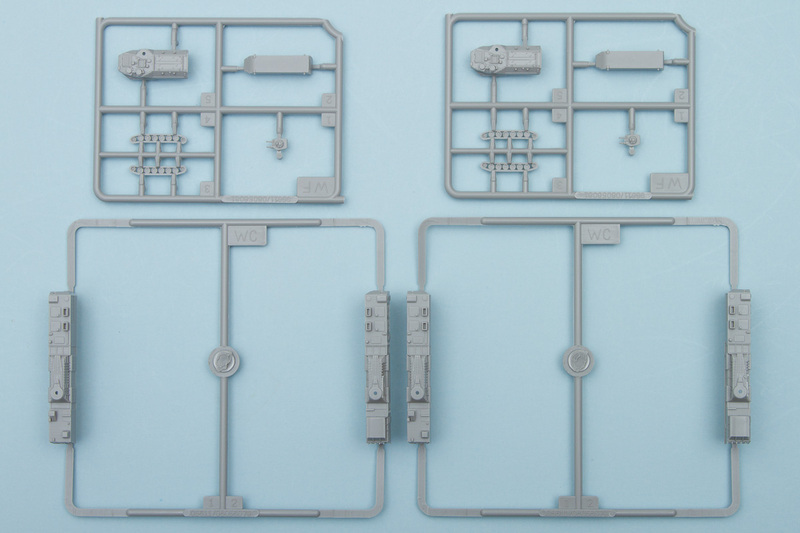 It is probably a bit much to ask for in a kit that is already well detailed, but I would have liked to have seen photoetch side doors for the UH-1N, as these are often seen with those doors open. The CH-46 and CH-53 both feature optional folded rotors, and both have separate right and left body halves with separate landing gear. The CH-53 also has the engine pods separate and a separate refueling probe and rear fin. Finally we have the MV-22 Osprey, which, like the others, has separate right and left halves for the main fuselage. The rear stabilizer is separate, with separate vertical fins, while the wing has a separate fuselage insert and separate engine nacelles at the tips. Like the CH-46 and CH-53, the Osprey also features optional folded blades. Painting and markings for this kit is pretty simple: paint it gray. All right, it's a bit more than that, but overall, this is one of the easier paint schemes for a ship. The lower hull is red, with the usual black line separating the red from the gray. The deck is a darker gray, including the flight deck. 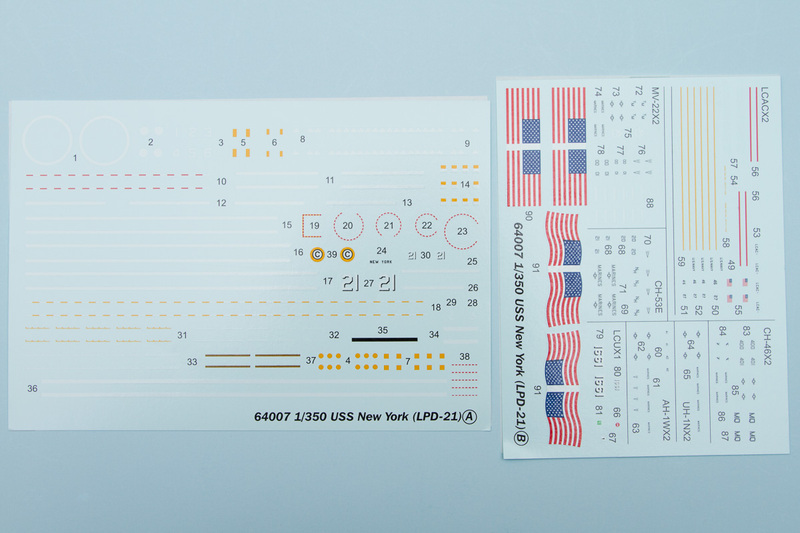 The rest of the color comes from the decals, which provides all the flight deck markings, hull numbers, and other ancillary markings. Overall, the decals are quite good, but they have one large problem that seems to be far too common with modern ship kits: the hull numbers are printed in black and white. These are actually low-viz and should be in gray. Markings for the aircraft and the LCACs and LCU are also fairly simple. The LCU and LCAC are both finished in similar colors to the main ship, and the LCAC gets a nice bit of decal deck markings. The aircraft all feature national insignia, tail codes, and aircraft numbers. There are no decals for the AAV-7, but the instructions do provide detailed drawings showing the intricate three-color camouflage scheme worn by the vehicle. This is another great ship from Gallery Models, and will make a nice addition to their existing ship line. Given the unique history of the USS New York, with its usage of WTC steel, this will undoubtedly be a popular subject, and while the parts count is high, the actual assembly is well thought out. This means we might actually see quite a few of these built up before too long. My thanks to MRC for the review sample.